TBILISI, Georgia — Radical Orthodox Christians and clerics are warning the LGBT community in this eastern European nation that any demonstrations on the upcoming International Day Against Homophobia and Transphobia (IDAHOT) would be met with even harsher retaliation that what marred the event one year ago. 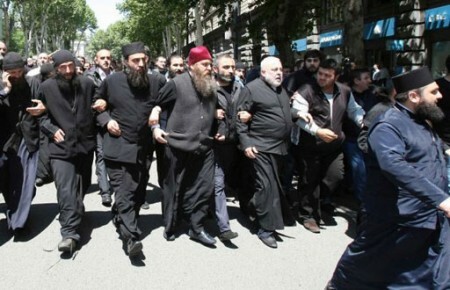 Thousands of anti-gay protesters, including Orthodox priests, occupied a central street in Georgia’s capital on May 17, 2013, to interrupt observations of the International Day Against Homophobia and Transphobia. During last year’s IDAHOT on May 17, 2013, a small group of LGBT activists and supporters organized a pride rally, but were met with attacks by several thousand anti-gay activists, including radical Orthodox Christians and clerics. Twenty-eight people, including journalists and policemen were injured. The U.S. State Department has criticized Georgian law enforcement authorities for not protecting the Georgian LGBT demonstrators in 2013, which caused the then Georgian Prime Minister, Bidzina Ivanishvili, to claim that the police rescued people from physical abuse. The treaty, which is expected to be signed by June this year, will include criteria for guaranteeing democracy, the rule of law, human rights, respect for and protection of minorities including sexual minorities. The principal group which advocates LGBT equality rights in Georgia, Identoba, told LGBTQ Nation Friday that the group hasn’t made any firm plans for this year’s UDAHOT. “It’s possible we don’t commemorate it at all,” said Natia Kharatishvili.